The flights of the orthogonal staircases are not always straight. On the contrary, most of the times they are polylines with successive sloped and horizontal segments. 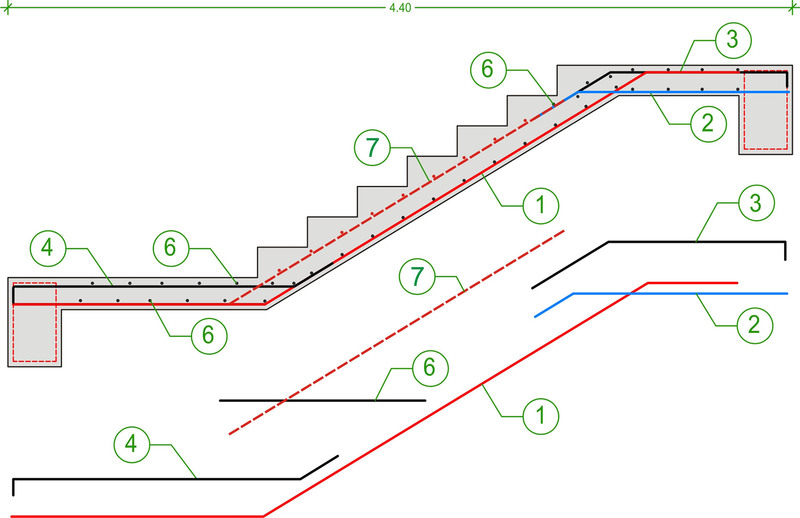 The following exam-ple shows a typical staircase with landings into which most cases are reduced. The negative rebars, apart from everything else, help in the proper concreting of the staircase’s sloped flights because they retain the wet concrete in a satisfactory degree. 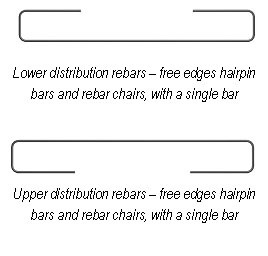 A good solution in order to cover the needs for (a) distribution rebars of the lower reinforcement, (b) free edges’ hairpin bars and (c) rebar chairs, is to use the unified bars shown at the next figure. Another solution for the combination of these three requirements is the use of the upper reinforcement’s distribution bars. This solution provides stronger rebar chairs.